When did Google start showing 4 PPC ads at the top on desktop? Google tested a SERP layout with 4 PPC ads at the top throughout 2015. This change was made permanent in February 2016, with Google also scrapping sidebar ads. Pete speculates that Google’s plan is to emulate mobile search results on desktop. 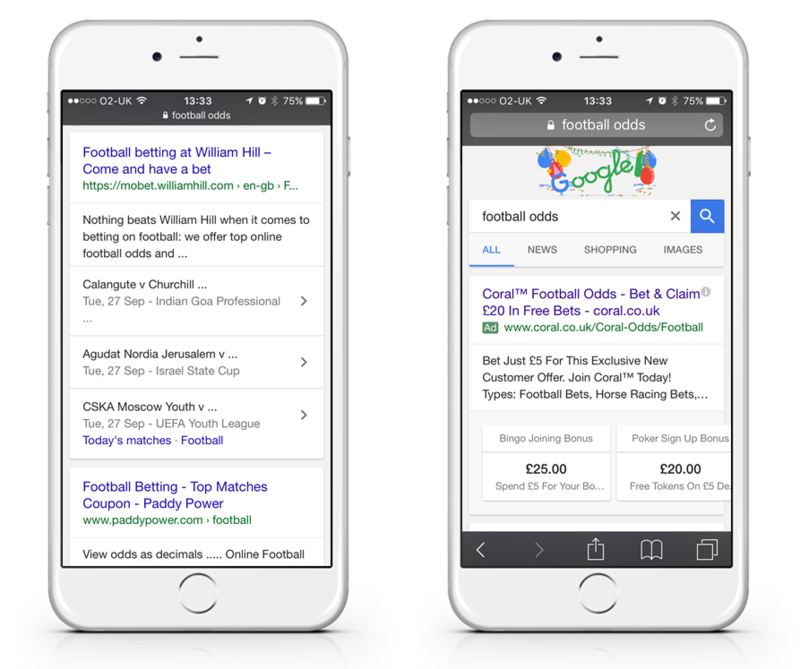 It’s not possible to show sidebar ads on a mobile (almost no smartphone screens are big enough) and with the majority of searches now being made on mobile rather than desktop, it makes sense to adopt a mobile first mindset within Google’s search product. When did Google start showing 4 PPC ads at the top on mobile? 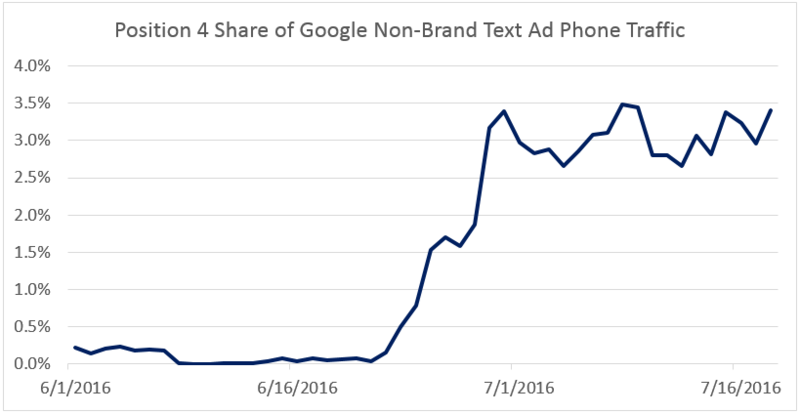 Google started to show 4 PPC ads above organic results frequently on mobile in June 2016 – pretty much exactly a year after 3 paid ads first made an appearance on mobile. Merkle’s Andy Taylor again took a snapshot of the roll-out on mobile devices. Andy’s graph shows when traffic being driven by ads in the 4th position started to ramp up (i.e. when the 4th ad appeared). How did this affect organic CTR on mobile? We create custom CTR models for our clients based on the data available in Google Search Console. 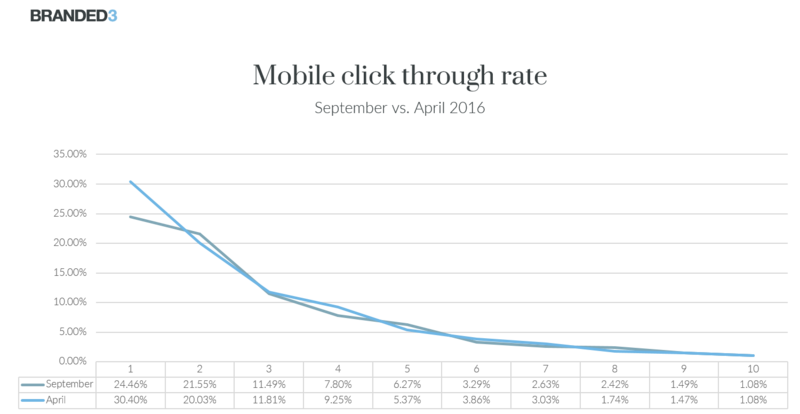 B3’s Senior Analyst Emma Barnes published a step-by-step guide on how to calculate your true click through rate in 2013 – or you can download a spreadsheet which will do it for you here. 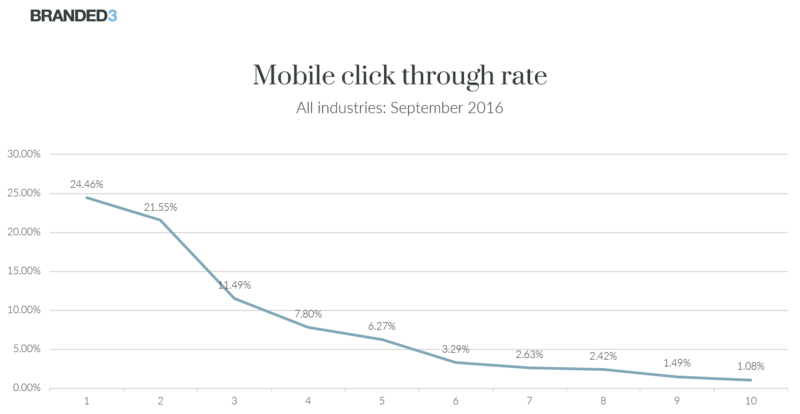 Using this method we analysed the click through rate of 200 websites from Google Organic searches on mobile devices. I’ve broken this down by industry where we have at least 20 profiles. First, here’s the current CTR of all 200 websites (note that this data was pulled before Penguin 4.0 rolled out in September so ranking positions are relatively consistent). …and here’s how this compares now. Only one thing has really changed: the CTR for position 1. Our assumption is that searchers are clicking on the 4th position the same way that they always have, but now that’s a PPC ad whereas before it was organic. The change is most pronounced in the travel sector. A 4th PPC ad has absolutely annihilated CTR for position 1 organic. Very little changed in the iGaming SERPs following the addition of a 4th PPC ad. Position 1 is clicked almost as frequently and users still rarely click on anything else. 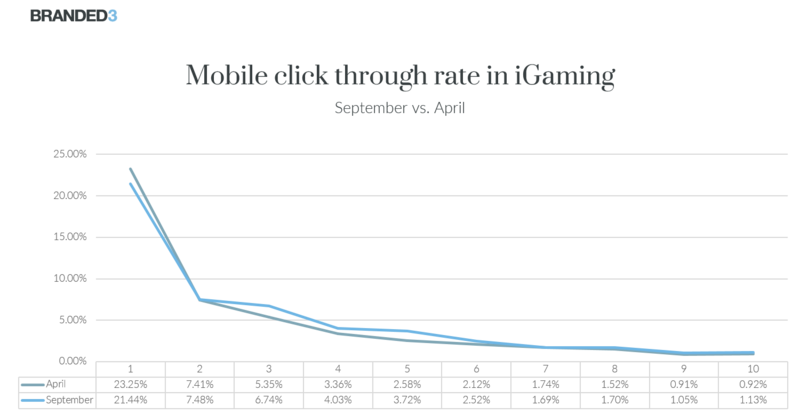 It’s worth noting that CTR for anything less than position 1 in iGaming is low on mobile because the PPC listings take up SO MUCH SPACE (e.g. below for “football odds”). Finance is another industry hit hard by the changes. The Google Organic CTR for position one on mobile has dropped more than 10%. CTR for lower positions also fluctuates more due to the location of News and AMP results in SERP results. Are you an SEO working in retail? Do you work for ASOS? Good news! Position 1 and 2 have seen an increase in CTR. Otherwise it’s pretty much business as usual. 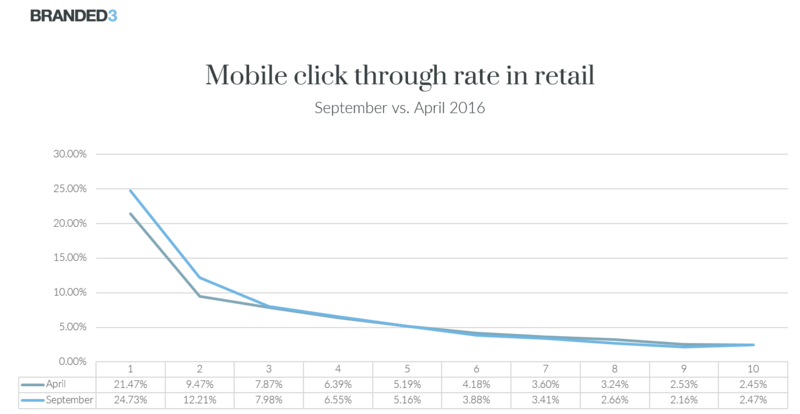 The retail sector generally consists of more stable SERPs because it’s not typically a hotbed of AMP and news listings. Searchers are confused by a 4th PPC ad. They click on it because that’s the level they always scroll to when they click. Green labels probably don’t help. This will probably correct itself in the coming months as searchers become used to the additional bad experience paid listing. Every single industry we track sees more than 50% CTR on organic. 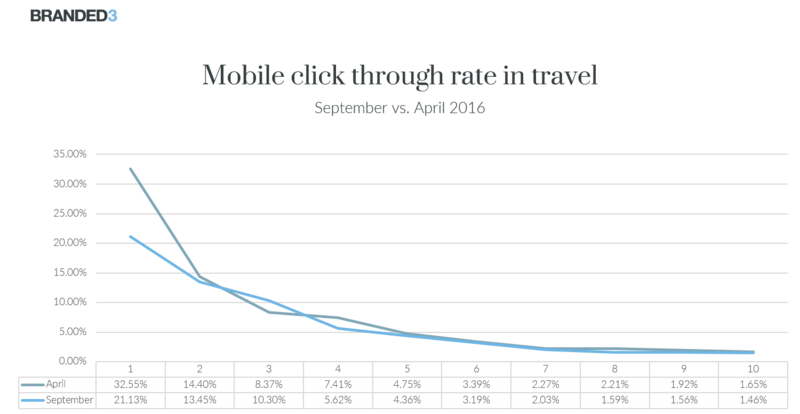 The lowest is iGaming (51.5% of users click on an organic listing on page 1), compared to 67.1% of clicks going to an organic listing in the finance sector, 64.72% clicking an organic listing in travel and 71.21% organic CTR in ecommerce on mobile. Organic CTR has decreased by a small amount overall but position 1 has lost big. Positions 2-10 in ecommerce SERPs get 46.48% of the clicks now vs. 44.92% in April. 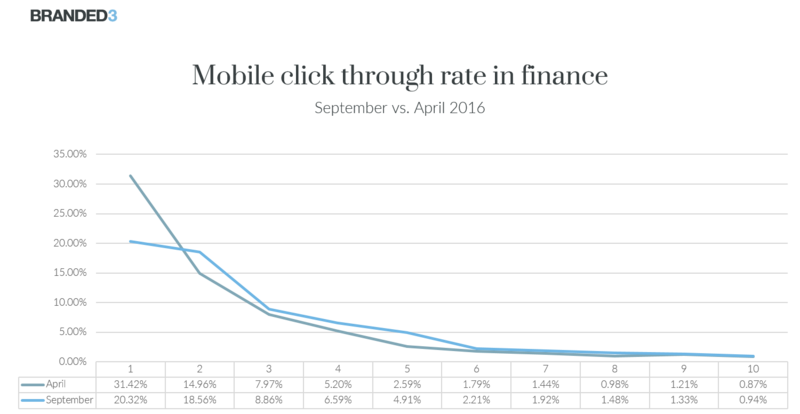 46.78% of clicks in finance go to positions 2-10, vs. 37.02% in April (the majority of that 10% CTR loss from position 1 has actually gone to other organic listings as searchers appear to be more keen to avoid PPC ads in the financial industries). A 4th PPC ad is having less of an impact on organic CTR than Product Listing Ads did (in sectors where PLAs are relevant). Has the 4th PPC ad at the top affected your traffic? Tweet us. If you want to see how CTR has changed in your industry just let us know and I’ll pull some data.